The term “legend” is usually reserved for a revered musician who is long gone. However, there are times when you must apply this to someone living and active and doing absolutely wonderful things with his gift of and genius for music. Hilario Durán is one such musician. When Mr. Durán came to Canada from Cuba in 1998 he came with credentials that went before him. His compatriot and pianist maestro Chucho Valdés had this to say about him: “Hilario Durán is an unparalleled pianist, as well as being a composer and arranger of the first order… one of the greatest Cuban pianists of the 20th century”. He might have included this century as well. Praise such as this does not come easily from a musician as great as Mr. Valdés. But if there’s anyone who deserves to be so celebrated it is Mr. Durán. But here’s the thing: some musicians might rest on their laurels (and the pianist wears many) and become complacent and glib. But not Hilario Durán. With his quicksilver mind, as sharp as a rapier, he has continued to go from strength to strength, performing and producing many magnificent albums with his own trio that includes Roberto Occhipinti on bass and Mark Kelso on drums, and also with the great soprano saxophonist and flutist Jane Bunnett. Perhaps one of his greatest assets has always been composing and arranging music. This year, Hilario Durán returned to a setting he has perfected like few other musicians: writing for the large ensemble. And this was not simply for a large ensemble, but one as stellar as the Toronto Symphony Orchestra. To celebrate the many facets of Pan-American Culture and in time for the Pan-American Games, Mr. Durán was commissioned by the TSO to write a concerto for Orchestra and Trio through support from the Esther Gelber Fund. Sinfonía Afrocubana was the result of that commission. 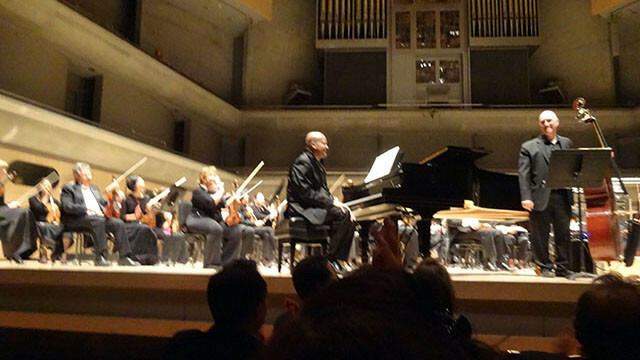 The world premiere of this iconic 19-minute piece took place at Toronto’s Roy Thomson Hall on April 29, 2015. 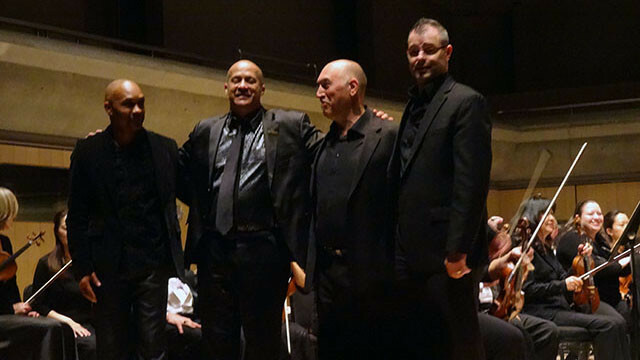 It was performed by a superbly rehearsed Toronto Symphony Orchestra conducted by Maestro Roberto Minczuk and Hilario Durán’s trio of repute. The music for the Sinfonía was a searing performance that also featured Joaquín Hidalgo on batá drums. This, in addition to glorious and melismatic writing, conjured vivid images of the Afro-Cuban heritage of its composer, and also celebrated the forthcoming event for which it was written. However, Mr. Durán writes in a veritable Babel-like language. Here as elsewhere he has refused to be constrained by artificial boundaries that peg his music into boxes. With the lines that separate contemporary jazz, classical and Afro-Caribbean music blurred the music soared like a proverbial condor. This intriguing work was based on the bembé, a 6/8 rhythmic pattern that emanated in Africa, but was absorbed into the many-splendoured Cuban musical topography. To bring the rhythmic aspect of the composition to life the ensemble featured the three batá drums, Okónkolo, Itótele, and Iyá, sacred percussion instruments used in the Santeria worship unique to Cuba. Remarkably Joaquín Hidalgo performed on all three drums. And the heavens seemed to open as the Sentir was sent up to worship the munificence of the Creator – Afro-Cuban style. This first movement of the Sinfonía began with a dramatic unison passage featuring the trio and the entire orchestra. After a melismatic piano cadenza, the trio and percussionist Joaquín Hidalgo introduced the main theme, a rich and molten mix of the musics of the world from Cuba and America to Europe and back. This was followed by a series of calls and responses and dramatic dialogues between orchestra and trio, developing the piece through melodic and rhythmic inventions. This was followed by the second movement that borrowed from many traditional Cuban folk forms heralded again by a breathtaking cascade of piano cadenzas. The orchestra responded with crisp retorts and introduced the trio that proceeded to develop on the stated Afro-Cuban themes and forms. Again, Mr. Hidalgo was featured and he gave a fantastic account of himself in the breathtaking array of colours he brought to his percussion battery. Mark Kelso followed with a predictably superb solo with the orchestra. After a large tutti declaration the movement was brought to a close with a solo bass cadenza from Roberto Occhipinti. 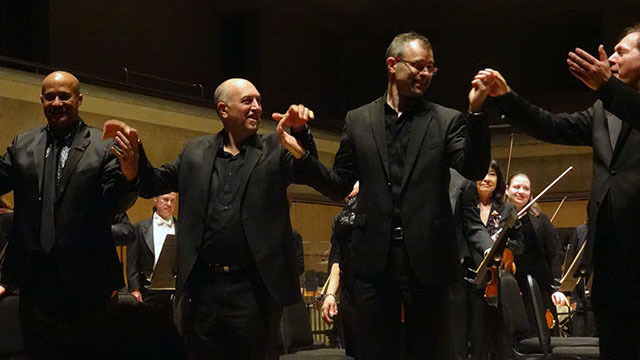 The third and final movement was based on the classic rhythm of the dancing son montuno danzón, accompanied by plush strings in the memorable style of George Gershwin. 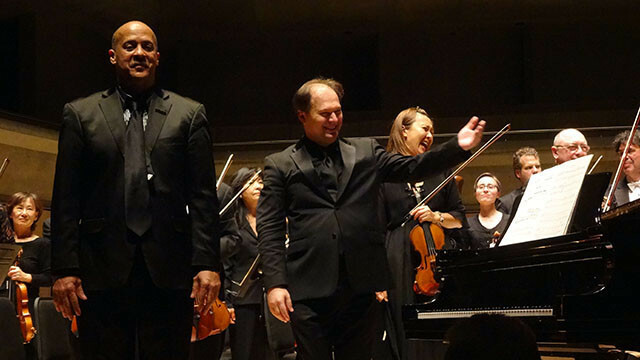 After what was a beautiful and interminable piano cadenza, the full orchestra entered playing themes in which Afro-Cuban bembé and Spanish flamenco styles were highlighted. This was followed by a dazzling display of the trio playing modern jazz, which finally led to a restatement of the main theme of the first movement to end Sinfonía Afrocubana. And so ended not only a memorable event, but also another triumph for the great maestro Hilario Durán. TjaderAid – Cal Tjader Tribute: ¡Viva Cal!